This is an Chasing EL Wire Adapter Cable, a simple connector that splits up the four wires in a Chasing EL wire allowing them to be individually powered or controlled. Fai una domanda (Registrati oppure Esegui il Login ). This is an Chasing EL Wire Adapter Cable, a simple connector that splits up the four wires in a Chasing EL wire allowing them to be individually powered or controlled. On one side of this cable is a 4-pin JST SMP connector that can be attached to a chasing EL wire, while on the other side are three 2-pin JST PHR-2 connectors which are used in more standard EL applications. Two of the JST PHR-2 connectors are only equipped with one wire and one unused pin while the last connector has two wires (this extra wire supports common ground). With this adapter cable you will be able to use your Chasing EL Wires with our EL Sequencer and EL Escudo Dosproducts! 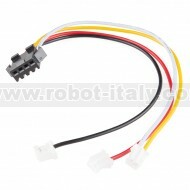 Shield Arduino per pilotare fino ad 8 EL Wires. Consente di creare sequenze, animazioni, etc. Se hai trovato questo prodotto ad un prezzo migliore, inviaci una segnalazione, faremo tutto il possibile per accontentarti. Il nostro Reparto Vendite rispondera' entro 24 ore via e-mail. Grazie per la tua fiducia in Robot Italy!